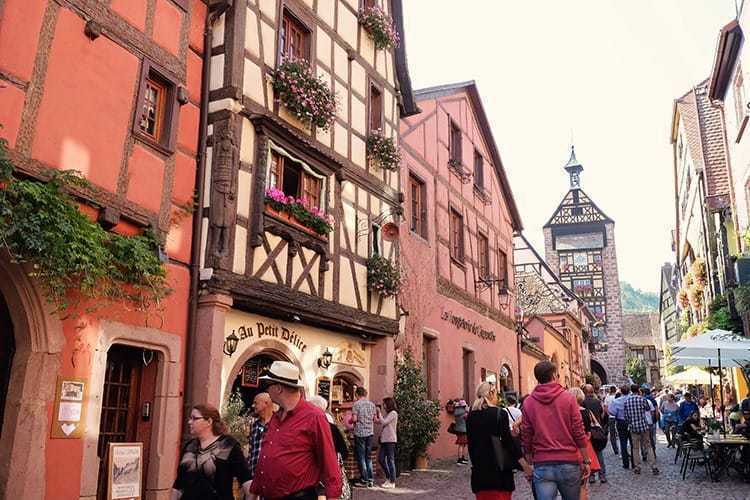 A breathtaking way to explore Alsace, France, is to travel via the foothills of the Vosges Mountains that run along the Rhine plain. This natural extravaganza, a part of the Regional Natural Park of the Northern Vosges, is listed among the UNESCO World Biosphere Reserve. 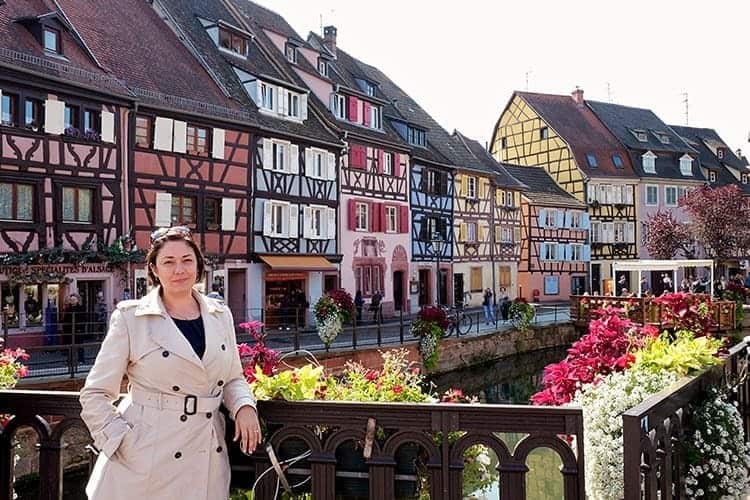 The quaint, marvelous scenes which mingle with history and culture leads one to the discovery of the most beautiful villages of Alsace in France. 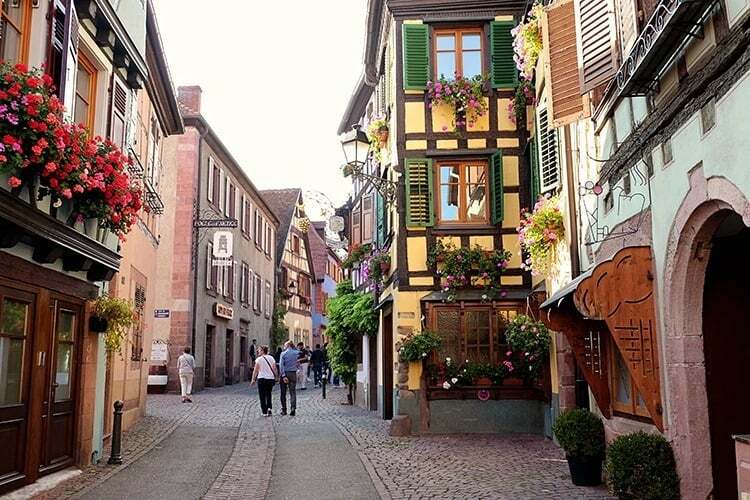 The medieval towns are as if taken directly out from books of fiction. 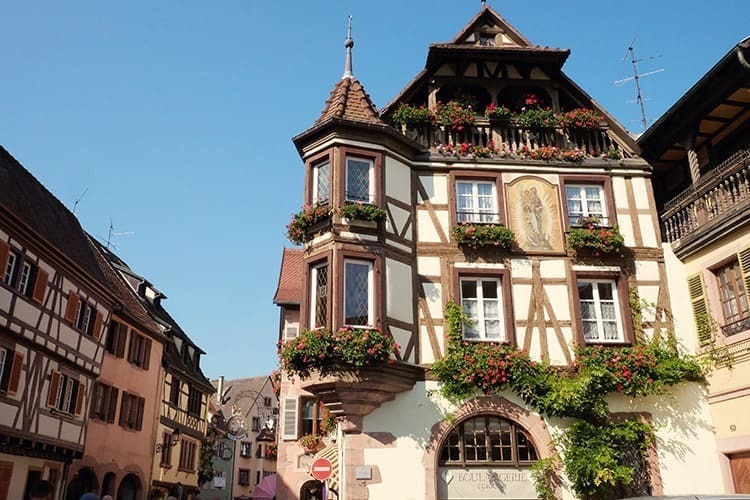 But how do you make the most out of your trip, especially if you don’t have time to complete the whole Alsace wine route? 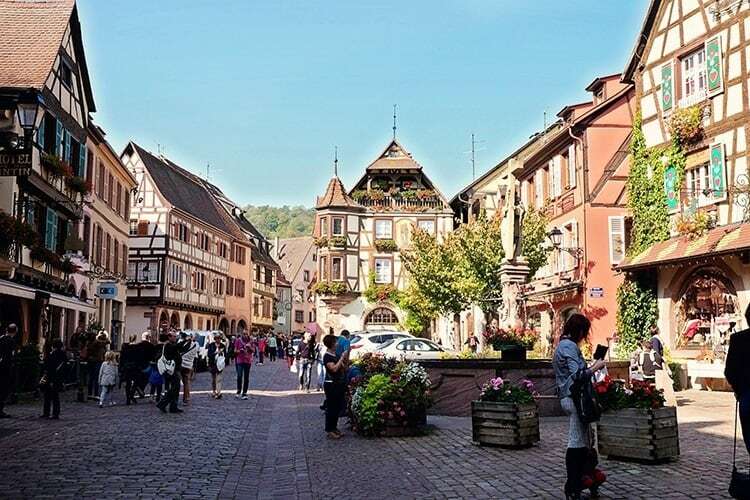 Well, here is our list of our favourite Alsace Villages that you should definitely not miss! 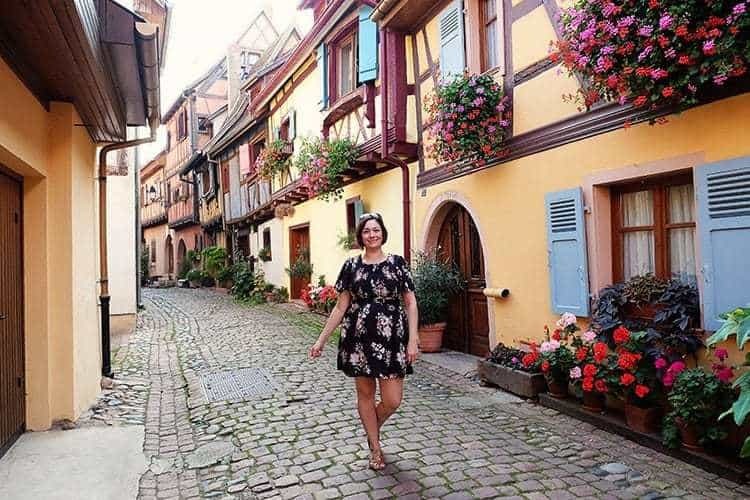 Here is a video to show you how stunning the Alsace region of France really is. 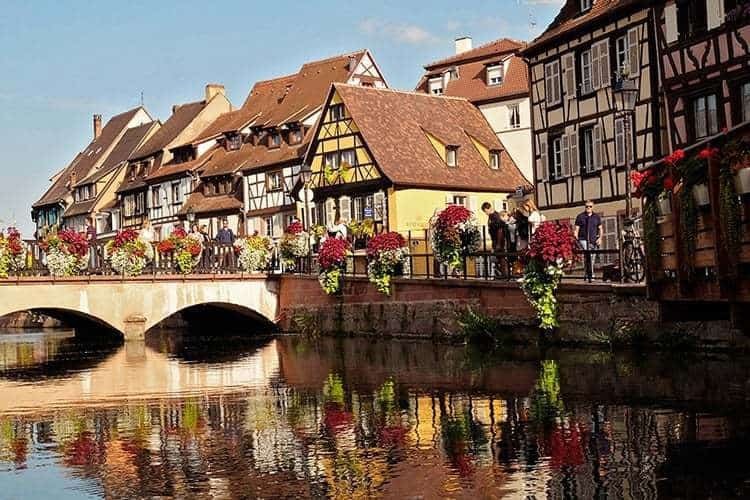 Find below our top picks for the best villages in the Alsace region of France. 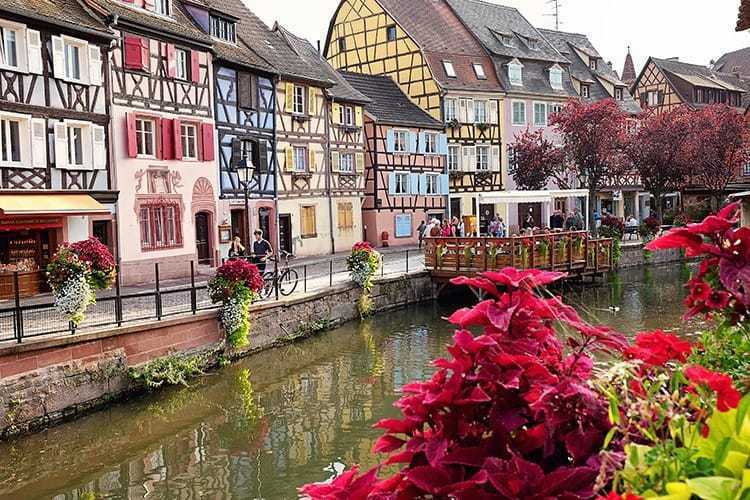 Whilst you can visit these all in one day, we do highly recommend that take 2-3 days to really enjoy the magic of these fairytale villages in Alsace. 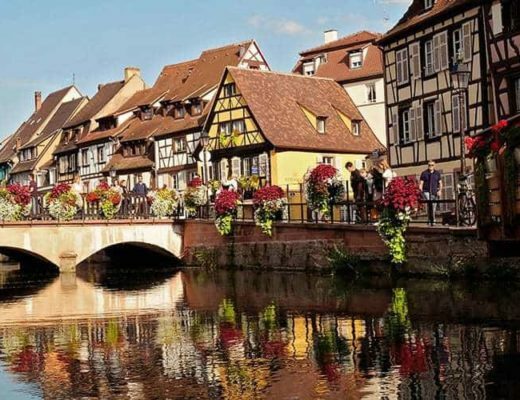 A center of culture since the 13th Century, Colmar is a picturesque city located at the heart of Alsace. Painted with scores of architectural landmarks and an impressive cultural heritage, this city had important roles to play during the Protestant Reformation in the 16th century. 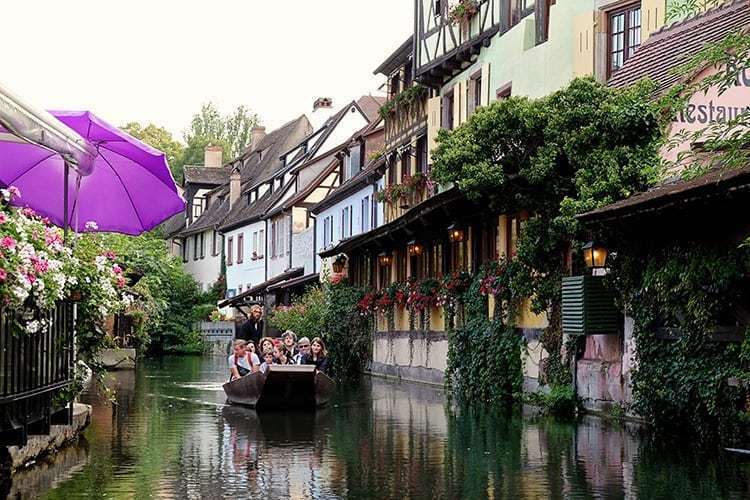 Meandering lanes and canals keep the historical charm in momentum. Krutenau Quarter: With a semblance of Venice, this area is perfect for a walking tour and a boat ride. 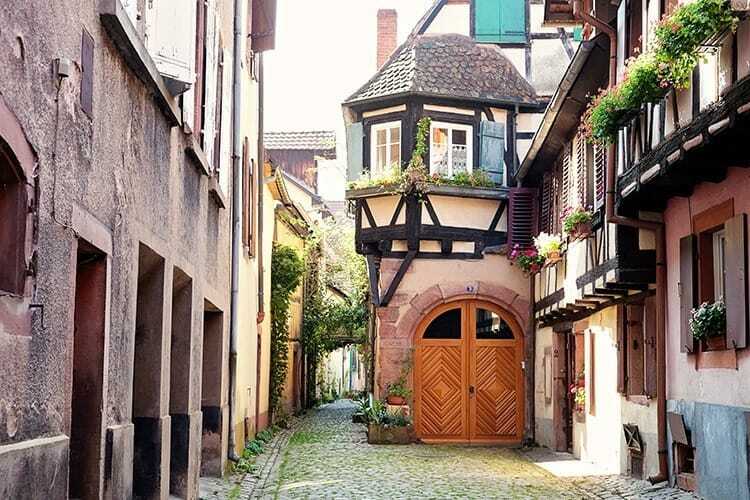 The journey is embraced by half-timbered houses adorned with germanium. Maison des Têtes: A Renaissance building crafted in gothic measures. 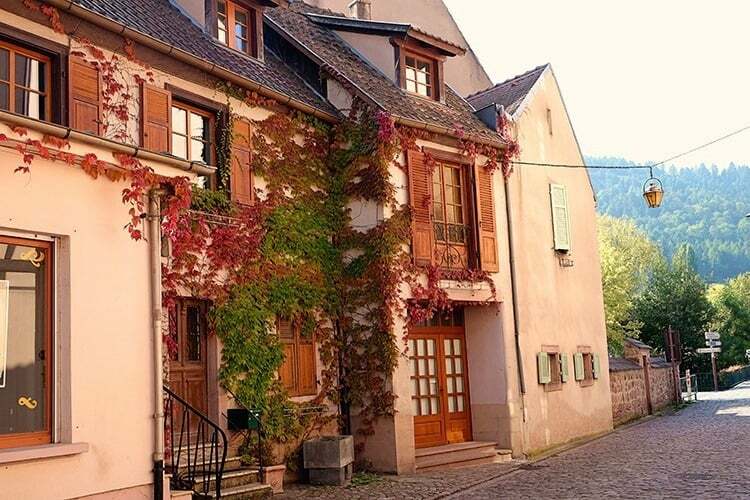 Maison Pfister: A fantastic example of the Alsatian culture and architecture. Église Saint-Martin: The largest church of Colmar and one of the largest in Haut-Rhin. Église Saint-Matthieu: A church from an ancient 13th century with carved Gothic stained glass windows and exquisite renaissance wall paintings. Couvent des Antonins: Notable for the rich, ornate cloister. Musée Unterlinden: Houses Matthias Grunewald’s glorious Isenheim Altar and the splendid Eglise des Dominicains. Koïfhus: A commercial heritage which was once the political and economic center. 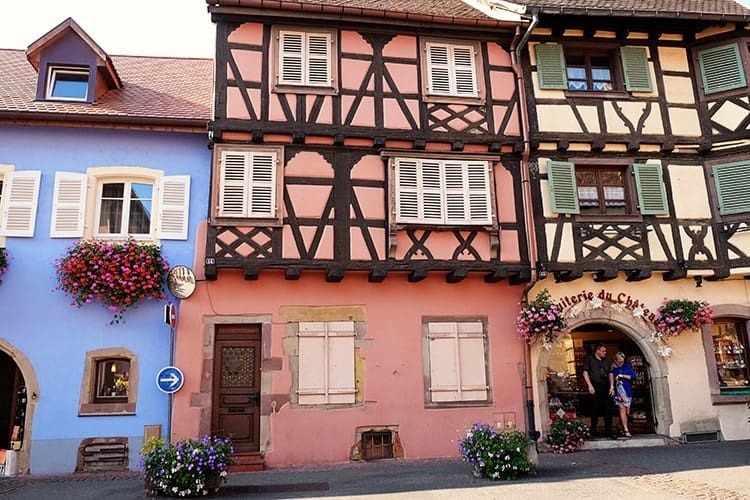 Click here to read our comprehensive Colmar travel guide. 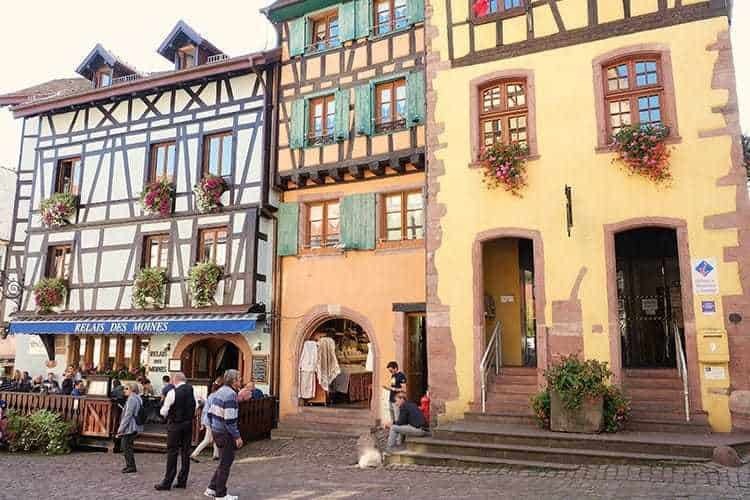 Regarded as one of the “Most Beautiful Villages of France” (Plus Beaux Villages de France ) and a Flowering Village (Village Fleuris), Riquewihr, is Alsace’s gem and a popular tourist attraction. The mighty church steeples with the gothic architectural pattern rising along the hills embracing the village. A village that boasts with its prevailing silence is home to only 1200 inhabitants. 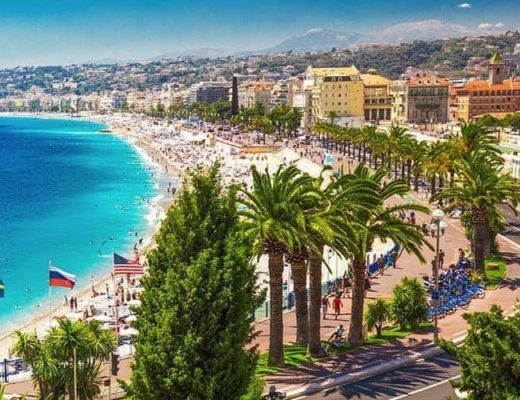 Mainly run by tourist funding, the village has plenty of cafes, boutiques, and restaurants. 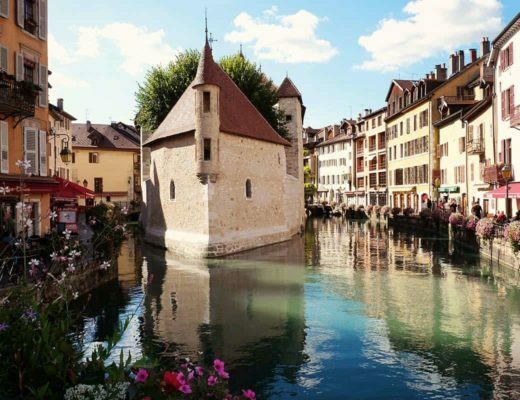 Tour des Voleurs: Built in the 14th century, the Tour des Voleurs, which is also known as the “Thieves’ Tower” provides an all-encompassing scenic view of the entire village. Rue du Général-de-Gaulle: This is the main street of the village that allows pedestrians in the summer. 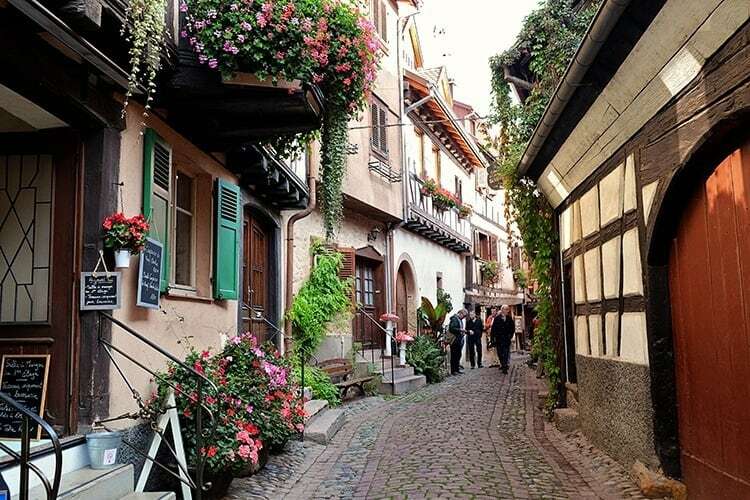 The street is surrounded with medieval fortifications and Renaissance houses from 15th to 18th century. The ancient walled houses are decorated with flowering scenes. While taking a stroll, you will also find public squares embellished with fountains. Dolder gate tower: Built in 1291, this place is now a museum with remnants from World War II. 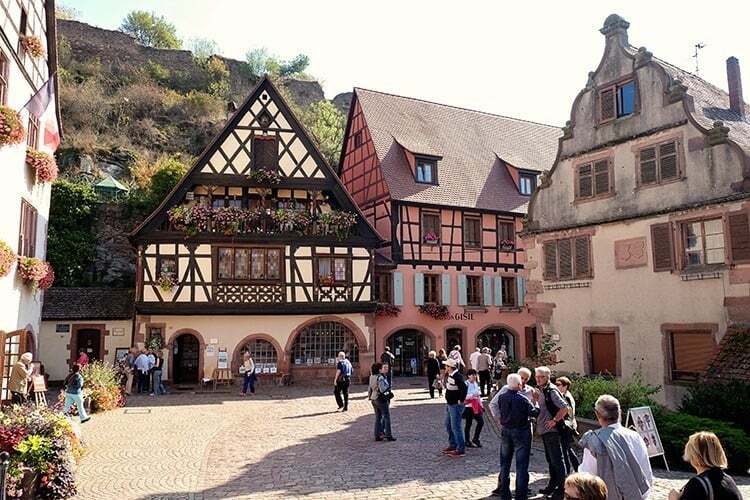 The village with its medieval setting that houses 5000 inhabitants is only 4 kilometers away from Riquewihr. 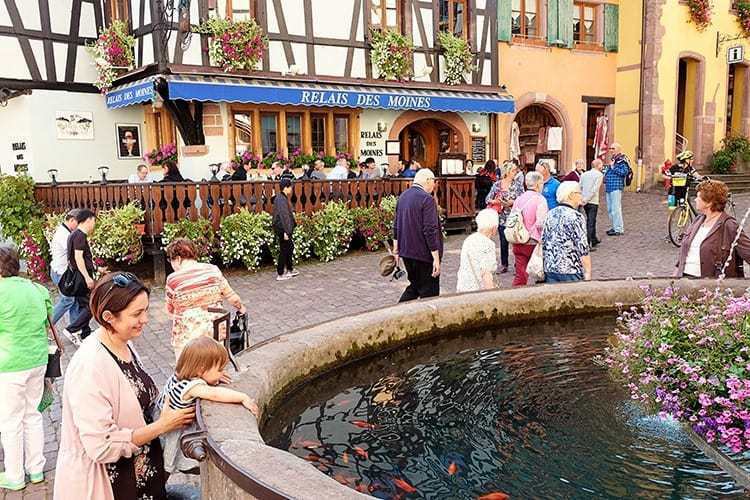 As one of the most gorgeous villages of Alsace, it has been awarded a 4-star “Village Fleuris” for its breathtaking floral displays. Balanced on a hilltop, ruins of ancient castles overlook this quiet place. 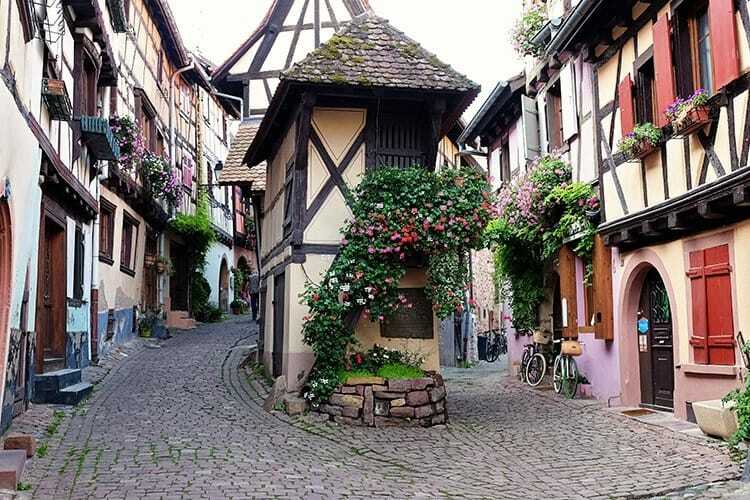 This little, exotic beauty is adorned with half-timbered houses from as early as the 15th century. The village is also popular for its vibrant culture. 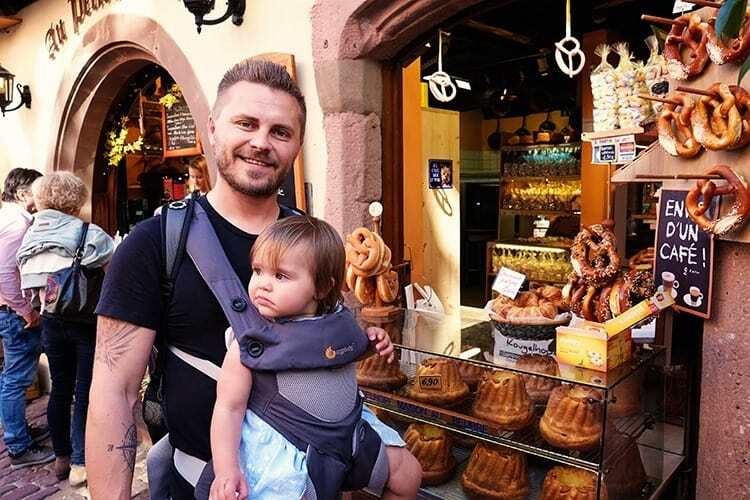 The people celebrate the annual events like the much renowned Kougelhopf Festival in May, the cultural Festival of Ancient Music in October, the melodious weekend of Fiddlers' Fair in September and the Medieval Christmas Market. Pfefferhaus: By taking the main street Grand-Rue, one will behold the Pfefferhaus at the address of number 14, followed by Hôtel de Ville (Town Hall). 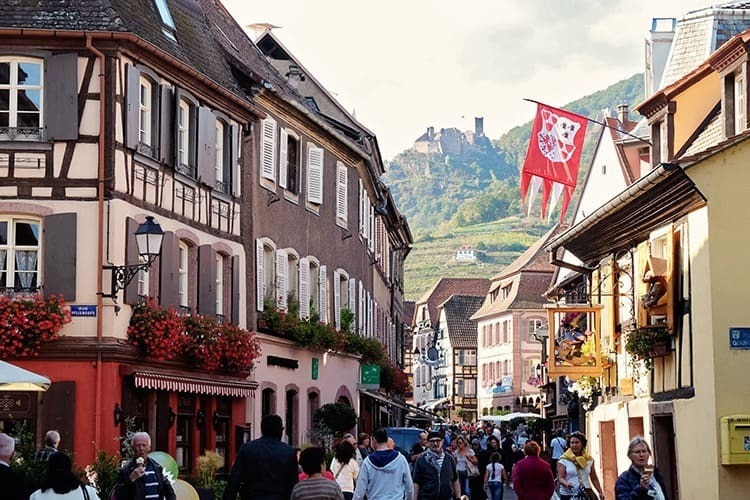 The street will also take you to the ruins of three famous castles Haut-Ribeaupierre, Girsberg and Saint-Ulrich. Haut-Ribeaupierre formerly belonged to the lords of Ribeaupierre. Tour des Bouchers: A preserved tower (Butchers' Tower) from the Renaissance. 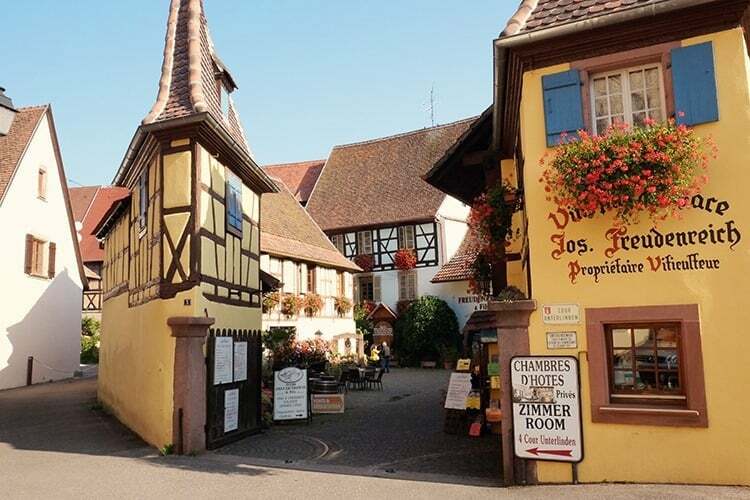 This village is a tourist-hub, as the Alsace “Wine Route” passes the village. Archaeological evidence has shown that this village has been surviving since the Paleolithic age. 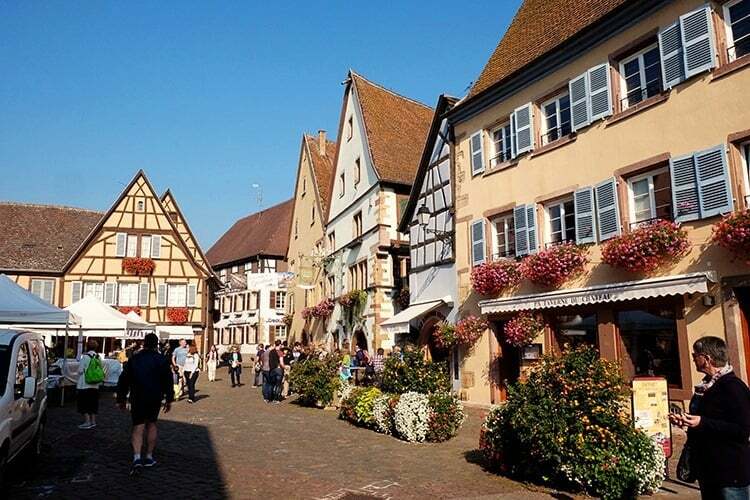 Again designated as “The most beautiful villages of France” (Les Plus Beaux Villages de France), Eguisheim is a sunny village surrounded by the rolling and green foothills of the surroundings. 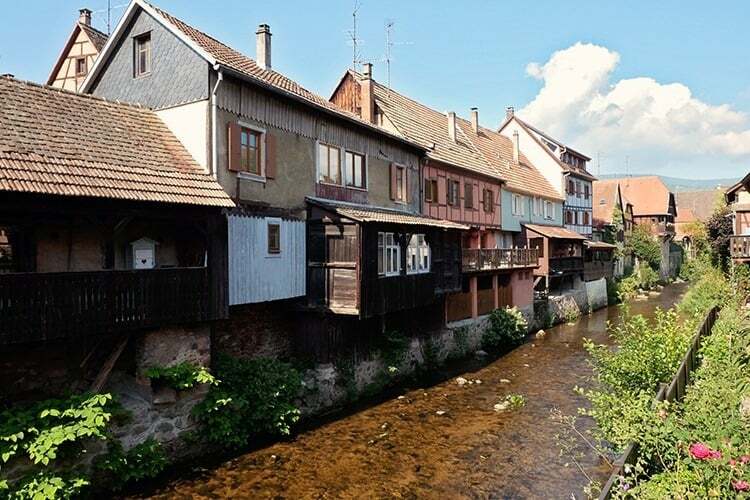 Founded in 720 by Count Eberhard, this medieval village is located not very far from Colmar. 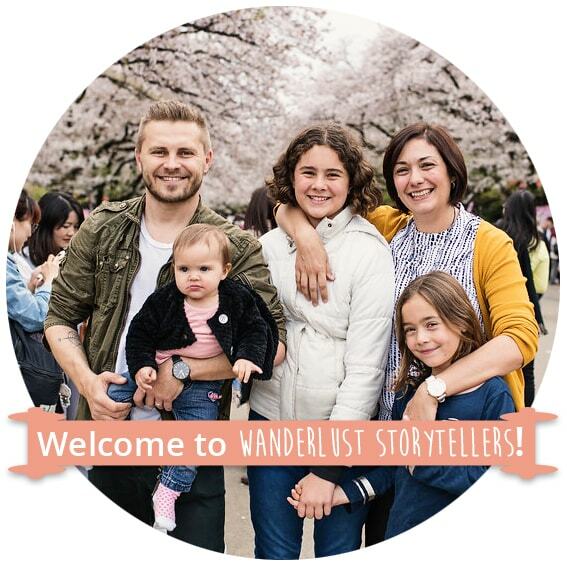 There is nothing much to do apart from admiring the beauty of the buildings, the ancient inscriptions on the stone-walls, and the magnificent geranium-bedecked window. Vierge Ouvrante: A 13th-century yellow sandstone church that has the statue of the Virgin Mary. 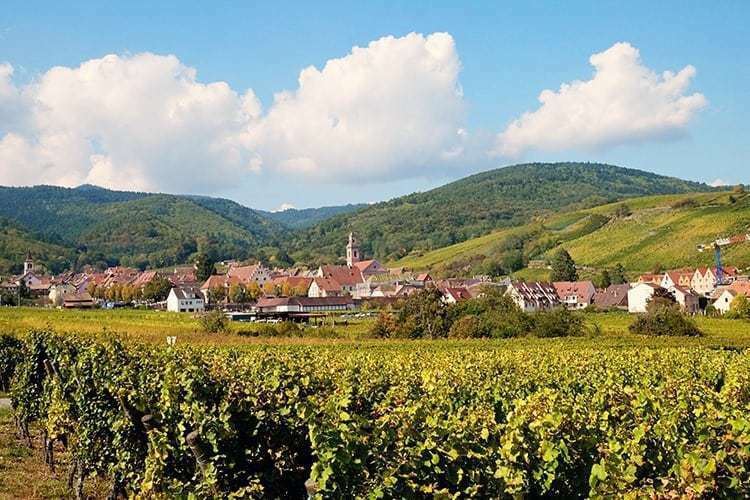 Situated at the mouth of the Weiss Valley, Kaysersberg is one of the finest wine-growing areas in Alsace. 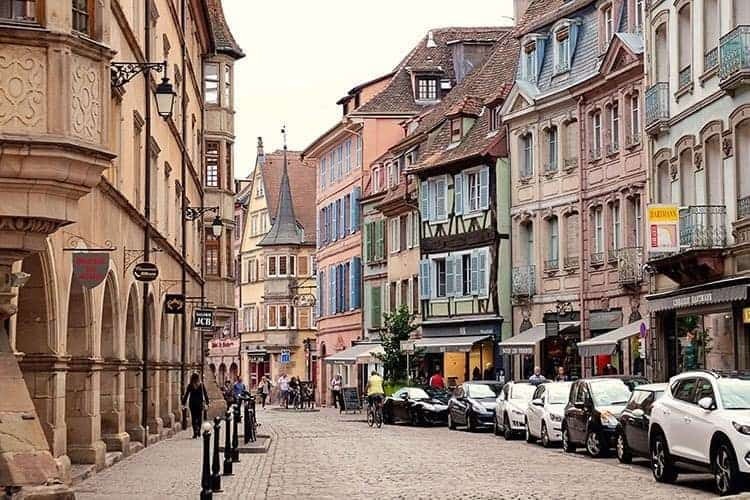 Located in the northwest side of Colmar, this Free Imperial City of Kaysersberg was once ruled by the Hohenstaufen Emperor Frederick II in 1227. 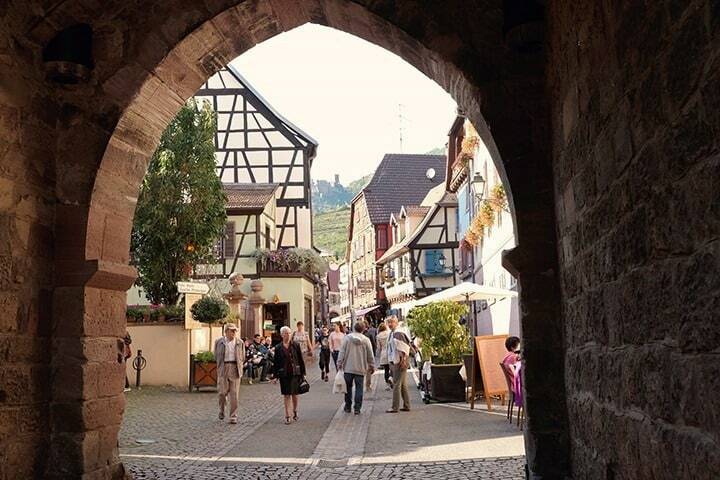 The ancient fortress that overlooks the this popular Alsace village is a reminder of its historical warlike past. Between the Franco-Prussian War and the First World War, Kaysersberg was annexed by Germany for a period of 48 years. A place of solitude with a population of 2700, the village boasts with its Renaissance and Gothic structures. 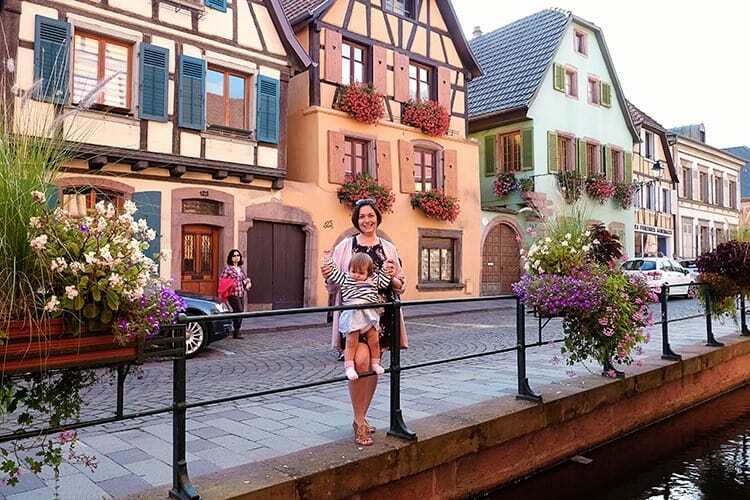 The exquisite floral patterns strewn across has made the village earn its position as one of the best “Flowering Cities and Villages” (Villes et Villages Fleuris). 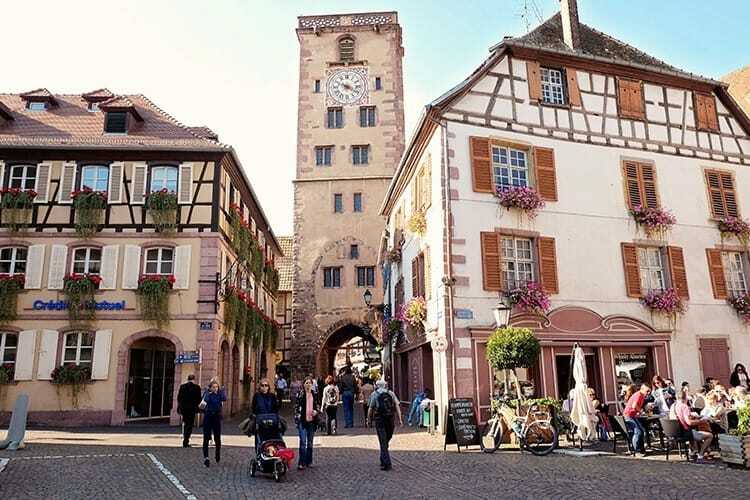 The area has also been the birthplace of Albert Schweitzer, the famous musician, theologian, philosopher, and physician; and of the Protestant Reformer Matthew Zell. Chapelle Saint-Michel: Notable for the exotic frescoes preserved from 1464. Hôtel de Ville: The Town Hall carved with Renaissance-style decorations. Weiss River: The fortified bridge over the Weiss River gives the magnificent view of Kaysersberg. 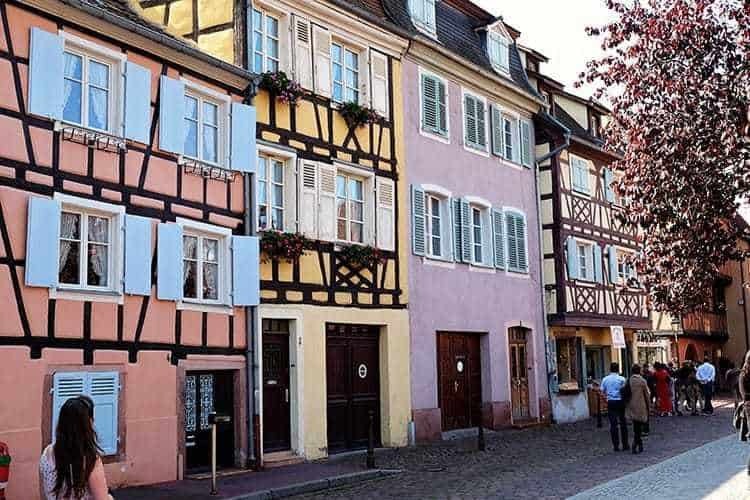 A paradise for travellers and nature lovers, Alsatian style entices its visitors with the half-timbered, pastel-painted houses adorned with flowering balconies. 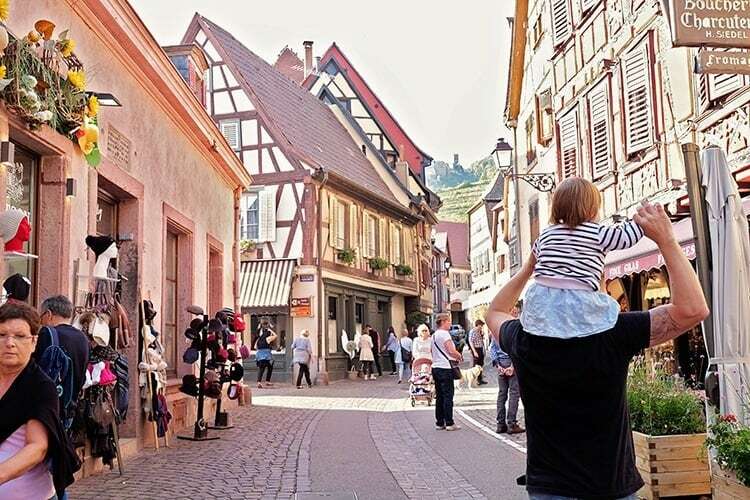 The fortified streets with cobblestones and erect castle walls are of historical relevance. 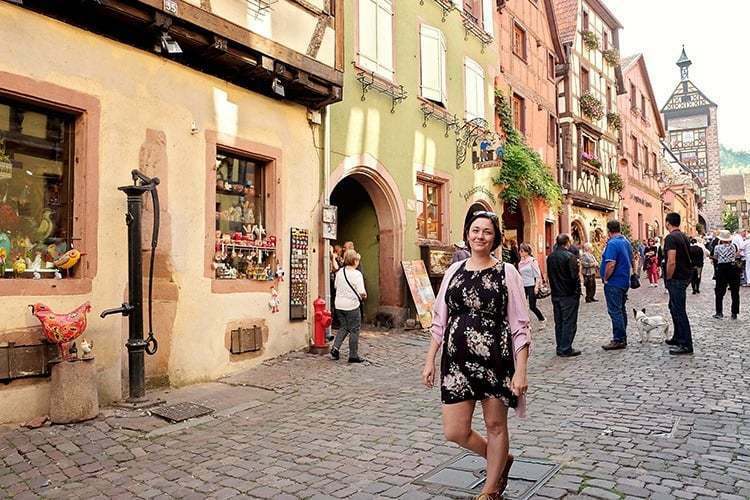 The narrow alleys and meandering lanes with Vosges Mountains as the onlooker, Alsace villages are a perfect holiday destination! 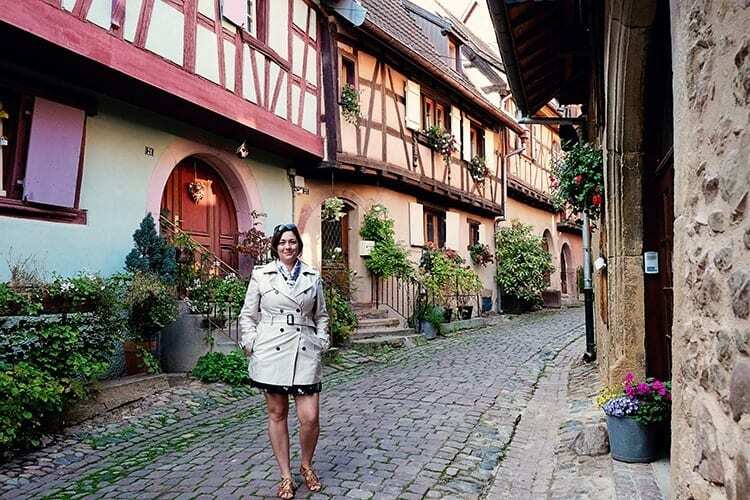 We hope you enjoy our Alsace travel guide to the best Alsace towns. Oh really excited to know that you are from South Africa too.